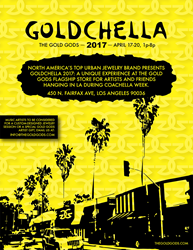 The Gold Gods, the industry-leading street culture jewelry and accessories brand, is proud to announce GOLDCHELLA 2017, an in-store experience for music artists visiting Los Angeles, California during the Coachella festival. With no official affiliation to the Coachella Valley Music & Arts Festival in Indio, California, but rather in alignment with, Goldchella 2017 is a weeklong experience at The Gold Gods flagship store for music artists visiting Los Angeles during the weekdays in-between the festival weekends. Located at the epicenter of the street culture scene on Fairfax Avenue, guests visiting The Gold Gods flagship store for Goldchella will be treated to complimentary cocktails, receive exclusive industry accommodations on jewelry and accessories, and experience a VR shooter game designed by The Gold Gods; all with the musical sounds of Coachella in the background. In addition, select guests will have the opportunity to custom-design their own Gold Gods piece of jewelry with The Gold Gods creative director and founder Cam Love. 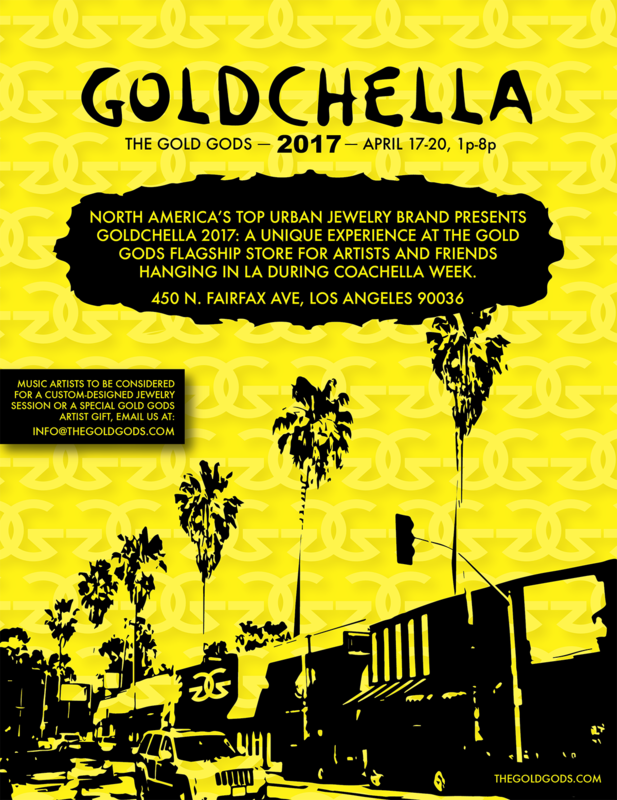 Goldchella 2017 presented by The Gold Gods is located at 450 N. Fairfax Avenue, Los Angeles, California 90036, open between Monday, April 17th and Thursday, April 20th, 1pm-8pm daily. For more information about The Gold Gods, please visit http://www.thegoldgods.com; for music artists interested in being considered for a custom-designed jewelry session with The Gold Gods founder please email your request to info(at)thegoldgods(dot)com.